The paint is still wet, the smell of fresh code lingers in the air. We just finished our latest major product update and it’s with great pride that we today announced that our next generation paywall is ready! See also: What Is a Paywall and How Does It Work? This new generation paywall is built for the future. We wanted to build something that will last and that can handle all the innovative features we have in our backlog. So we decided to rebuild from scratch. Being a monetisation partner to huge content owners and technology partners, we know that our main responsibility in the these relationships is to make sure the end-users trust them enough to open their wallets. With our many years of experience in this field and from countless of behavioural data analysed, we know that trust comes from how they perceive the product. People’s attention span and impatience with poor UX is at an all time low. If the product crashes during a transaction or behaves unexpectedly, the end-user will loose trust and leave. The same goes for if it takes too long for a transaction to go through, people will think something went wrong and reload and try again. Or worse – they will leave and try and find alternatives to getting what they wanted. We’ve always had a fast and stable paywall, but with this new release we made it even faster and improved the technology stack used to fit our seamlessly scalable backend that can handle thousands of transactions per second without the slightest hiccup. Our new paywall is built with combination of React components – this allows us to add new features even faster in the future, and our very own custom JS SDK which results in cleaner, more readable code, and – again – faster development! The common perception is; if it looks old, it is old. So we made sure to build a new fresh interface that matches new standards and that behaves as would be expected on all screen sizes. With this release we’ve completely updated our icon library to be as clear and universal as possible. You will soon see these new icons in use in our admin dashboard as well (yes that’s a hint that we are working on design improvements there too). One of the more important design improvements is the new way to display pricing options. 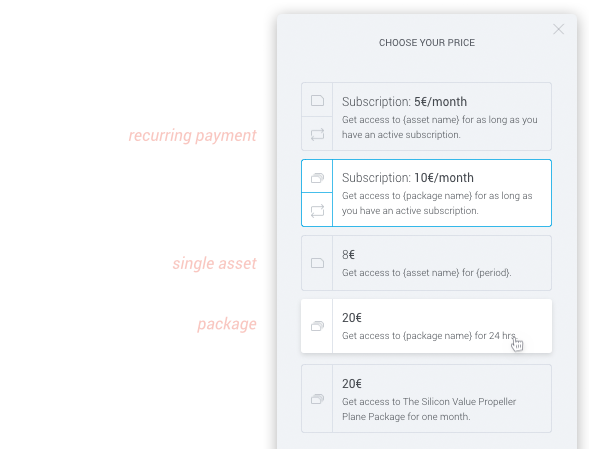 It is now much easier for the end-user to understand what prices are one-time, time limited, recurring subscription plans or whatever your pricing strategy includes. Understanding what you get is also something that unblocks end-users when going through the simple steps in the purchase process. The site the end-user is on should match the experience the get from the paywall that pops up. We’ve added very flexible branding opportunities to allow our clients to set their own flavour on the paywall. The expectation is that they will pay them for access to premium content – so we made sure that is matched by the look and feel of the paywall. Clients can change the accent colors of buttons and add their logo and more. A few weeks ago we made it possible for corporations to add multiple branding themes for the paywall and asset preview. So if you are managing multiple events with different brands – this feature will be extremely useful. Are you as impatient as we are to start using this new paywall? Well, nothing is stopping you. The paywall is ready and available from your InPlayer dashboard already. To use it you just pick the “paywall v2” when you grab the embed code for your asset. The same goes for all your pre-existing assets. Since we’ve made dramatic improvement to the tech, the embed code has changed, so if you want to start using the new paywall you just need to update the code you are using for your assets. Read about all the available features of our paywall on our paywall page. But as with everything – it’s always better to experience it for yourself. So sign up and try!